I had the pleasure of fly fishing with David Schultz and his business partner Jerry, who flew in from California last week. Both are dedicated fly fisherman who have traveled to many world class fishing destinations in pursuit of their passion. David was lucky enough to fish all week, but Jerry was able to stay only three days before he had to be back. David's wife Mary and his four year old son, Adam, finished up the week. They we staying in Marco/Naples fly fishing out of Chokoloskee. the tarpon showed up just as we thought. The fish we the perfect size, 25-60lbs and were holding in a deep swash in the turn of the river. This was going to be a blast. We drifted back to the fish and using an Everglades Deceiver, (tied by John Drsicoll - Toxic Shark, Inc.) and started fishing. With fish rolling all around us and flies all around the fish, we caught nothing! David did have three fish roll up and bump the fly, but none took it deep enough to be hooked. Swapping flies did not help. The fish were there and they were feeding, however, they were just not eating what we presented. After we got tired of watching the tarpon "thumb up their noses" at us, we moved to the mouth of the river to fish the tidal current seams, oyster bars and flats for snook. With the exception of the tarpon, the river had been relatively quite. Too quite! We saw only a very few snook bust the shoreline on the way out. Sure enough, the mouth was quite also. 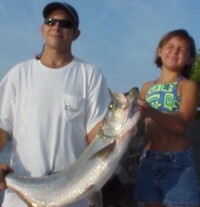 The place we were fishing is a classic setting for fly fishing snook and redfish. It has numerous bars, sand flats, mangrove canopies and tidal rips all very close together and within easy reach of each other. An angler can fish all these different scenarios in a relatively small area and the action is usually very good. Not this morning! We did not raise a single fish!! It was frustrating. The weather had just changed and the wind shifted to the southwest. Though this direction is probably the worst for fishing the "outside", we moved out of the river to the front anyway to find some fish. The wind was just too strong for the outside, so we went back into the 10,000 islands and fished some passes and creek mouths after the tide switched. 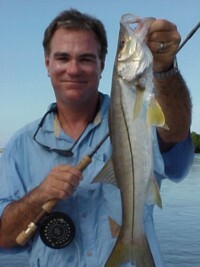 We had some action on jacks, ladyfish and snappers, but the snook we not eating the fly. The wind was up and dictating where we could fish in this area and we still had to find some fish ... time for a boat ride into the backcountry where the southwest wind is not a factor. .
We came back south past Chokoloskee and into the deep back country. It was beautiful as usual. We did see a few nice cruising snook while poling, but in all cases too late for a good presentation. The snook were not laid up in the places that we usually find them, so this "hot-spot" turned out to be like the others this day ... frustrating. 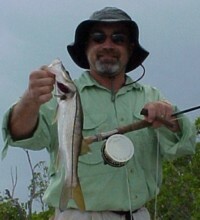 Gerry did manage one snook from out of the trees. With our bottom lip hanging a bit we headed back to port just talking about the fish we saw! I got up early that morning and listened while drinking my coffee on the dock. I could hear the snook busting the trees in the mangrove creeks within ear shot. About three hours later and after sunrise, we left Chokoloskee and headed for the creek mouths. By the time we arrived the snook had stopped feeding and all we saw were manatees!! There was a late rising full moon and the snook were feeding at night. We tried a few more "reliable" snook spots and made casts at more rolling tarpon before we changed our plan. That day, we had left the 17' Roberts flats boat that we use for fly fishing at the marina and were in the 20' Super Dolphin to hedge our bets. By mid-morning, it was apparent that this day was going to be a repeat of the last if we kept up this pattern. So we pointed the boat south, netted up a couple thousand pilchards and headed off for cobia and permit!! We never got to fish for cobia. Once Gerry and David got a taste of the permit, it was all over!!! Another batch of permit junkies was born! The fish were consistent in size running 15-20 lbs. In and around the area were also schools of jacks in the 6-10 lbs range. 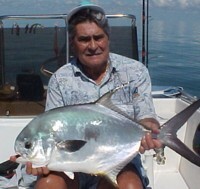 Gerry boated two nice permit using spinning gear and had several other fish on. David stuck religiously to the fly rod. He had 6-8 real chances with nice presentations that day. 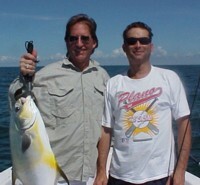 As it turned out, Gerry and David had a double header on with permit. Gerry on a spinning rod and David on the fly. That was exciting. About 10 minutes into fight, David's fly pulled out of the fished mouth. That, as it turned out, was the beginning of a trend. Gerry landed his fish about 25 minutes later. Sorry David. 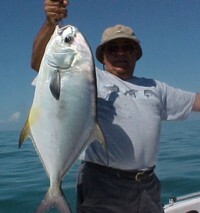 David did manage to land several nice jack crevalle on fly. Pound-for-pound, this is one of the most underrated fly fishing targets you can fish for. How many 8lb fish do you know that eat flies ravenously, are easy to locate and can run you into the backing of a 10-12 weight every time? They are a blast on any gear!!! We had seen a bunch of fish this second day and it was very clear what were going to do on Gerry's third and final day. We took off with a load of live bait for area offshore that holds cobia, kingfish, Spanish mackerel, etc. This was a long trip, but I had visions of grandeur and David had visions of cobia on fly. When we arrived, there were turtles all around, birds and mackerel circling the boat. We manage some small grouper, snapper and a few of the mackerel. We had three nice runs on the spinning gear of unknown species. However, even with the live chumming, we were unable to bring up cobia from the bottom so David could get a shot at them with the fly rod. David did get a nice strike, likely a big kingfish, than blistered him deep into his backing, but the fly pulled. Sound familiar? With the loss of the David's kingfish, we moved back to the permit grounds. On the way there, we saw the big jacks and could not resist. The guys loaded up their fly rods and I positioned the boat along side the school. When everyone was ready, I heaved a handful of pilchards at the wolf pack and the surface immediately exploded. That sure is a tough time to be a pilchard. David was on the bow and Gerry was on the stern. Another handful of pilchards, more explosions and David's fly gets gobbled off the bow. Explosions at the stern. I turn in time to see Gerry's fly get gobbled. Another double!! Back to bow ... as the fish streaks off line David is clearing his fly and gets him on the reel. He's okay. Back to the stern. Gerry strip sets, the fish streaks, he is clearing line, the fish is on he reel. He is okay. But just as the fish runs gets on the reel, the fly pulls. Remember this re-occurring theme! That's fishing! Oh well. The permit were next. They were everywhere. Big fish and big schools. At any one time we were looking at 2-300 fish. Everywhere. We caught several fish on spinning gear, but not one on the fly rod. Not today. David had probably close to 30 superb presentations. We tried everything fly in the box, but NOOOOO! Not a single fish ate. Aghhh!! Though we did not get the fish to eat that day, I am very comfortable in saying that these two, well-traveled anglers, came away very impressed with this fishery. I am sure that they saw more fish and had more permit opportunities in this one day than they likely have had in their entire permit fly fishing careers. It truly is something special. 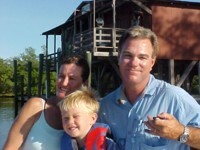 Gerry had to leave, so David's wife Mary and their four-year-old son Adam came aboard. As you can imagine, Adam dictated our action and as predicted, the aquarium/bait tank dictated Adam. I believe this is a exact quote ... "I got to go see more stuff now!" and back into the tank he would dive. We stopped by the live bait spot to add some critters to Adam's tank. Our first stop on Adam's trip was a place we call Spider 2. (Yes, there is also Spider 1 and 3). A couple of handfuls of pilchards and the surface was alive. Adam (oh yes, David and Mary also) caught trout, mackerel, jacks and ladyfish non-stop. Well, not quite non-stop. In fact ... actually ... now that I think about it, Adam had his head in the bait well non-stop and looked up only to catch fish ... sometimes. Any way we all had a blast. But it was time for the permit and cobia again. What a difference a day makes. 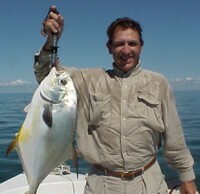 This day the permit were much fewer in number, though there still were plenty of fish. They were more shy and weary and tough to get to eat. We needed "virgin fish". Off to the next spot. This place is a transition area for the permit. They never seem to stay around but just seem to pass through. We just had to wait. The area was quiet except for the jacks and mackerel. I set out a flat line (Adam's) for the kingfish or cobia. David spotted a school of permit coming right at us ... perfect. Just as he said something, the flat line went off .... David cast perfectly and a BIG permit ate ... finally!!! Another double. 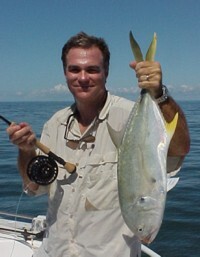 This time with a big permit on fly and a kingfish on spinning gear. David's line clears ...the fish is on the reel ... fly line and then backing screams out if the reel ... David's okay. Adam (with a little help) makes short order of the kingfish and we begin concentrating on David's permit. By now the fish is 250+ yards into the backing, but David has him in control. Now all we have to do is settle down a bit a fight the fish. But you guessed it, about 10 minutes into it, the fly gently pulls out of the fish ... again. For those of you wondering, the hooks are sharp and David was handling things perfectly ... go figure! The next day we headed south. David had yet to get a snook on fly. We tried one spot. David did catch one fish, but Adam was ready for more action ... permit action. We fished a different area than the day before and it was a while before the permit showed up. That's okay, the big jacks stretched the fly line nicely. 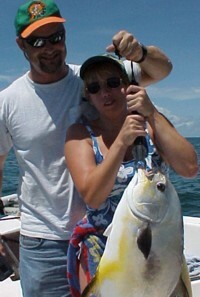 Once the permit did show up, Mary caught her first permit and David finally got one to the boat on fly. And, of course, Adam, caught a real nice speckled sea trout on the way back in. We drove back through the backcountry so Mary could see this part of paradise. It was a great week with some really good anglers. I made some good friends who I hope will be back. I am looking forward to fishing with Adam (and, oh yeah, Mary, David and Gerry) in the years to come. Saturday, I fished a 1/2 day with Ed Rumberger and his good friend Frank Perrotta, out of Naples, Fl. We stopped at one spot and caught a mess of Spanish Mackerel and a slew of Jacks. Frank had never caught a permit, so off we went. The first school of permit turned into 8 lbs jacks, oh well. However, after couple attempts, Frank was tussling with a 15 lb fish and 35 minutes later he was posing for photographs. All-in-all it was a good half day fishing with a good mess of fish for the table. Ed, say hello to the Mrs. and nice to have you back. For those who are attending the Ft. Lauderdale Boat Show, I will be speaking at noon on Saturday Nov. 2 about fishing this area. See ya there. 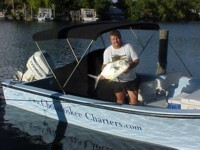 If you would like to book a charter with Chokoloskee Charters, contact Capt. 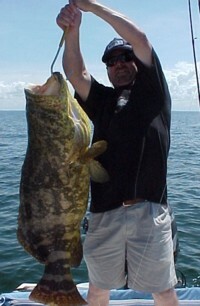 Charles Wright @ www.ChokoloskeeCharters.com or call him @ 239-695-9107. Tight Lines! (Kevin Stutz, Ohio with a "fat" snook from the black water.) However, there have been lots of white bait around, especially the ever-favorite "saw-bellied" pilchards. If the baits are big enough, try hooking them from underneath near the bottom fin. This way they will swim away from the line and tend to dive. It is great a way to send a bait under a mangrove canopy for snook and redfish. If you do not get a strike on the first few passes ... move!! This technique also allows you to fish very close to the mangroves by easily controlling the bait's movement. (Wayne Bowers, Ft. Lauderdale) While poling the shorelines, I have definitely seem an increase in the number of nice sheep head and small drum. I am not a big fan of using shrimp because of all the "by-catch", but they are a sure-fire method of taking these fish. The snook bite fell off around the full moon but has picked up nicely recently. This time of year the snook fight their best. They are fatting up, well past their spawn and are very healthy. While typically not as heavy as a spring or summer fish, they run farther, jump higher and strike harder. My favorite time of the year for snook. The fishing in the inside waters has been consistent for us though not red hot. The outside seems to be following the same pattern. one or two shots at the cobia just about every trip ... enough to make the effort worth while, but not like the typical half dozen shots we should be seeing anytime now. The pods are here, I just have not found them. I am taking the airplane up today for a look around ... I'll find them today!!! After all it is Brown Marlin Season!!! I have had a couple of anglers come from Naples fly fishing and a few others from PA fly in for the everglades fly fishing. 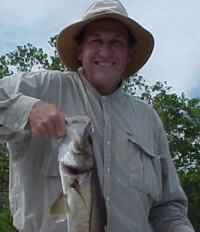 It has been real consistent, with good numbers of small snook and tarpon, as well as. lots of trout, ladyfish, mackerel and jacks. None have taken the time to fish offshore. That is a real shame because the excellent permit fishery. A couple of dead computers and one dying digital camera later, we are finally back up with the Everglades National Park and Chokoloskee fishing reports. From my recent experiences I have learned that I need to stick to finding fish and stay well away from trying to find problems with computers!!! Take my advice ....hire a professional. the cobia just add opportunities to turn a good trip into a great one. (The Stouts with their first permit!) We are catching lots of redfish along the shorelines and the islands. The beaches and oyster bars have been producing more fish on the earlier stages of the rising tide, while catching the fish coming out of the mangroves on a high fall seems to be the trick for the islands. A white butterbean buck tail jig tipped with shrimp has worked well, but the old stand-by 3/8 oz. red Rip Tide Jig with a 3" 12 Fathom swimming gold shad tail is still the bait of choice. If for no other reason, it eliminates the "incidental by-catch" associated with the shrimp! With the recent winds, live bait has produced many more snook and redfish in the turbid water. With Hurricane Lily still lurking, the winds may be up throughout the week, so live baiting is probably the answer for the next week. 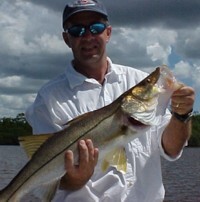 Snook fishing has been fairly consistent with many 15+ snook days to talk about. The bigger fish are getting farther apart and seem to be getting tighter and tighter to the structures both inshore and offshore. Live bait is by far producing the better catches though jig fishing is still very reliable. It seems that in the last weeks it has taken large baits, in the deeper water to catch the "Peterbuilt" snook. (A Goliath for Dave Butler-Jones from Ft. Lauderdale. 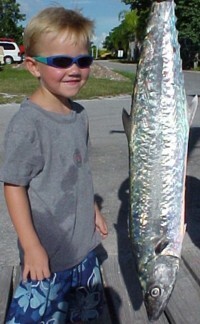 )Tarpon fishing has been sporadic except for the small fish in the rivers. However, there have been a couple of hot spots just offshore that have been holding nice fish in the 75 lb range early in the morning. Everglades fly-fishing generally has been very good with the Everglades Deceiver and glass minnow patterns producing lots of fish. However, if the water gets turbid, don't waste your time or shoulder, move into the back and find some clearer water. 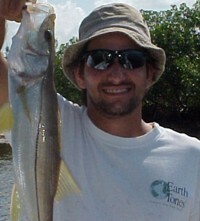 There are lots of fly-eating snook in the back country, but they are generally smaller than those out front. Recently, many anglers have been coming in from Naples fly fishing, while most of the others have been coming from out of State. The area makes an excellent fly fishing destination because of the pristine fishery and vast amounts of sheltered waters. Rarely can you be weathered out. The fly rodders from the rest of the State keep missing out!! The near shore structure has been excellent!!! The cobia are just beginning to stray into view. The water is still a bit warm for the big pods to the come in, but they are out there. We are getting a couple of good shots almost every trip. I just love catching these brown marlins. The Spanish mackerel are around, but certainly not in the numbers they will be later. The permit action has been hot with live crabs. However, catching these big trash can lids has been difficult on jigs and only a handful have made it over the sides on fly. 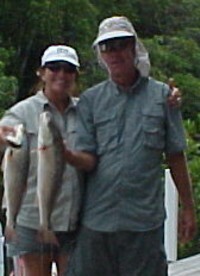 (Master Anglers Tim and Marilyn Campbell of Fort. Lauderdale with dinner!) For those of you who are keeping track, Permit number 271 was caught last week. One of my anglers suggested that we have a little counter on the website to keep a running total of the fish released. Better yet, we are going to implement a Permit Catch and Release Hall of Fame to recognized the other permit junkies who share my addiction. (However, I need your help. I have not been keeping track of who has caught how many permit. So please email me with your personal counts ... I will take it from there!). In addition to the recognition on the website we will have "awards and prizes" for the different release levels. (i.e. at your first release, the third, fifth, tenth, etc..) Details to follow!! 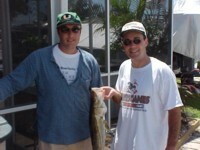 (Al Lipson from NYC and his brother Steve from Tampa and their snook lunch!) The 24' Morgan center console is nearing completion and will be christened the "The Blue Bird Daze". If things go as planned, she will be in service by the 15th of the month, just in time for the cobia run!! If you would like to book a charter with Chokoloskee Charters, contact Capt. Charles Wright @ www.ChokoloskeeCharters.com or call him @ 239-695-9107. Tight Lines!.